If a gallon of milk went for $8 and gasoline $5, there would be an uproar, says Greg Lebedev, whose group represents chemical companies. Yet that's roughly the kind of price shock some of his companies have been seeing for natural gas, which is used widely by the petrochemical industry. While most consumers aren't yet affected - though they'll likely see higher heating bills next winter - talk of a natural gas crisis is growing louder. The cost of everything from food to automobiles could rise if high energy prices persist, economists say. Some fertilizer producers already have laid off workers, and energy officials in states like Ohio, where natural gas is used widely for residential heating, worry that people will suffer "sticker shock" this winter when heating bills are likely to soar. The Energy Department is holding an all-day "natural gas summit" Thursday for industry representatives, energy analysts, state officials and others to discuss ways to ease the problem. But there is only so much that can be done, energy experts say. For the most part, consumers, utilities and large industrial users must use less gas. Expanding natural gas production will take years and do little to help in the short term, they say. "The quick fixes for domestic exploration aren't there," says Dennis Eklof of Global Insight, an energy consulting firm. In the short term, he says, "a lot will depend on the weather" and whether gas supplies are depleted during hot summer months. 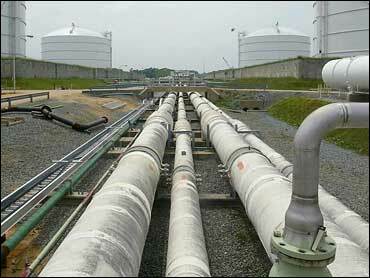 "If we're lucky with the weather, they will be able to rebuild (gas) storage going into winter. Prices will still be high, but we won't run into situations where there are massive plant closings or grandma freezing." Federal Reserve Chairman Alan Greenspan gave a simple explanation at a congressional hearing recently: Rising demand, especially from electric utilities that welcomed the clean-burning fuel as a substitute for coal, is outstripping supplies now heavily dependent on aging North American gas fields. Canada has a lot of gas, but it will take years to boost production significantly, and the same can be said of expanding imports of liquefied gas. This "modest gap" - as Greenspan described it - is causing havoc. The environmental benefits of natural gas - a relatively clean fossil fuel compared to coal and oil - spurred its widespread use over the past decade. Today, 90 percent of electricity growth is coming from plants fueled by gas. "A host of federal policies encouraged increased use of natural gas, in part to improve air quality, while policies based on outdated concerns about impact of natural gas production make it increasingly difficult for producers to meet growing demand," says Carl English, the president of Consumers Energy, a gas supplier in Jackson Mich. The wholesale price of gas jumped to more than $6 per thousand cubic feet this spring, twice what it was a year ago and triple what it has been in recent years. Although prices have declined - to $5.81 per thousand cubic feet this week, according to the Energy Department - economists predict prices will stay relatively into next year and perhaps beyond. The impact already is being felt. Farmers are paying $10 to $15 an acre more to plant crops since the cost of fertilizer tripled to $350 a ton this spring because of higher gas costs, Al Christopherson, a farmer from Pennock, Minn., recently told a congressional hearing. In Colorado and Wyoming, where natural gas wells abound, sugar beet processors are facing problems as well because of the high cost of the fuel. One beet-processing plant that uses natural gas, near Greeley, Colo., was closed because it was cheaper to ship beets to a coal-fired plant in Morgan, Colo. In Texas, Dow Chemical decided to shift one of its plants to Germany, in part because it expects high U.S. natural gas prices to persist. "Big companies won't go out of business. They will move," says Lebedev, president of the American Chemistry Council. While in the past natural gas markets have resembled the ups and downs of a roller coaster, with prices ranging widely from year to year, many energy experts believe prices may well settle in the $4 range, or higher, well into the future. Stephen Baum, chairman and chief executive officer of Sempra Energy, is betting that there "will be a sustained and growing shortage of natural gas" in the United States for some time, propping up prices. That's why Sempra, based in San Diego, is building two terminals to handle liquefied gas from overseas. "There's plenty of gas in the world, just huge quantities of gas that has no market," said Baum in an interview. Low gas prices - and concern about price volatility - up to now has made it unattractive to pursue LNG or the vast gas reserves penned up in Alaska's North Slope, energy experts say. With higher prices, Baum and other industry executives predict liquefied gas from the Middle East and elsewhere as well as Alaska gas will be worth pursuing. But terminals take time to build. And Alaska's gas will remain unavailable until a $20 billion pipeline is built.